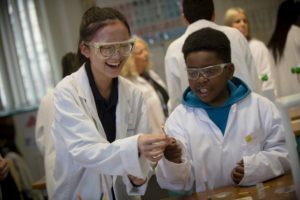 No school is an island and at King’s we believe we can gain much by engaging with partner schools and the local community. At our heart, we want to develop in our pupils not only the knowledge and skills but also the well-being, rights and responsibilities which will enable them to grow into valuable and productive members of society. Our partnerships programme is an important part of that preparation. Our pupils grow in character and resilience by widening the circle of people they meet and developing leadership skills or volunteering experience. Our teaching staff build local networks and share good practice by meeting with colleagues from other schools. King’s has a long tradition of sharing resources with the local community in accordance with its charitable aims and you will see examples on these pages of how we open the school to others to access our academic teaching expertise, facilities and events. Please get in touch if you are interested in partnering with King’s, or wish to support our partnership programme.